If you need ideas for great mason jar centerpieces or yummy cupcakes for your next party or tailgate, make sure you check out Ashley’s August Pinspiration Party Post! I’m back with another makeover from my Auction Action loot! I knew that I am not good enough at restoration to bring these back to full glory, but I gave it a shot. 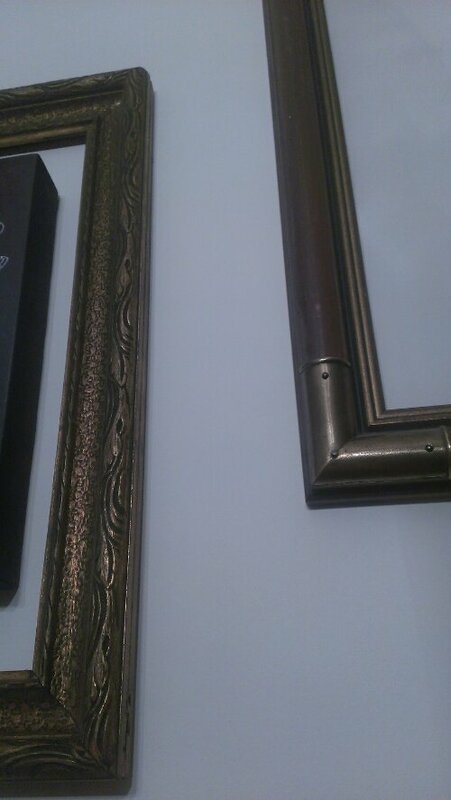 I glued where I could glue and where the glue wouldn’t work, I even had to put in a little screw that I tried my best to conceal with paint. 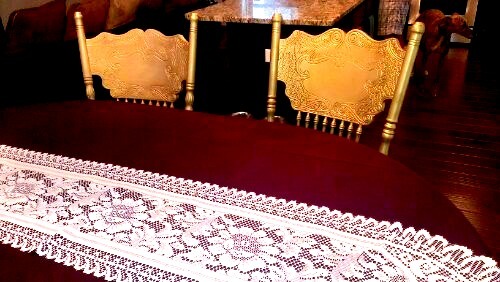 I recovered the seats with a dark purple linen from an old tablecloth, but they just didn’t have enough “shabang” to them. 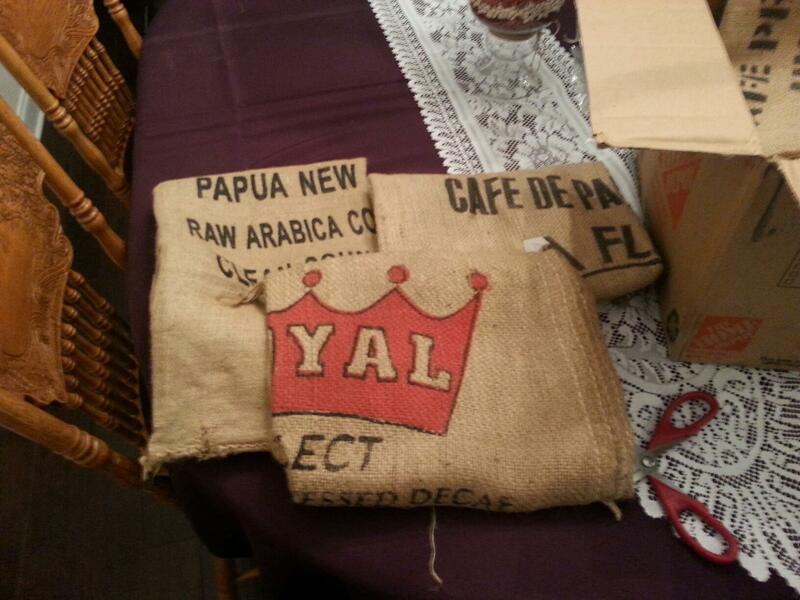 Enter eBay coffee sack lot… I got 10 HUGE coffee sacks with different logos for $22.50 including shipping. 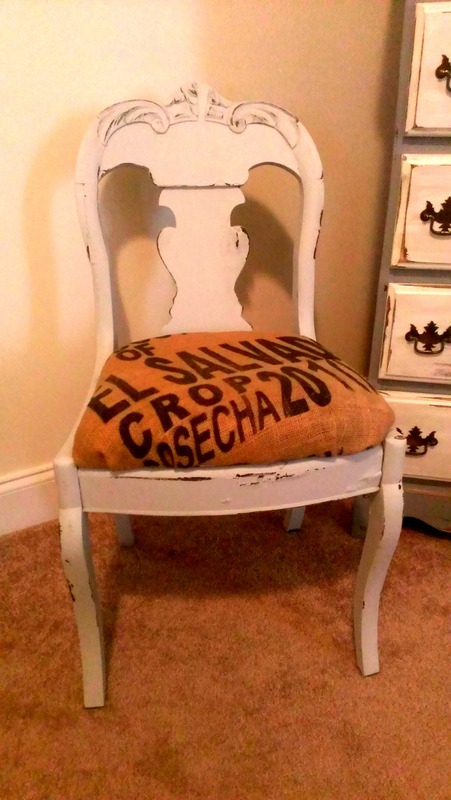 Not too shabby considering that it works out to be less per yard than plain old burlap fabric. 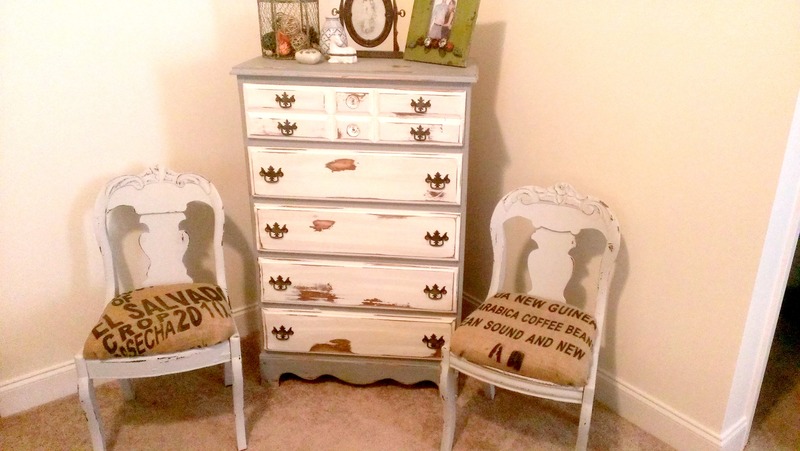 And here they are after being painted, re-re-covered and distressed… still not in perfect shape, but sturdy and cute. 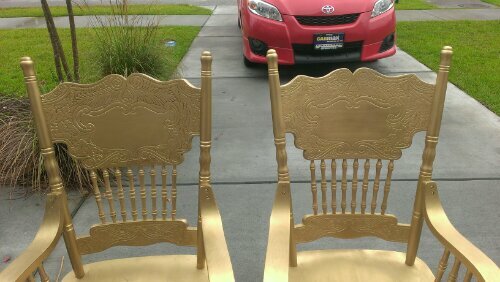 These got a really great response on Craigslist! The buyer really did get a bargain because they weren’t in pristine condition. And I have plenty more coffee sacks to use on future projects… so excited! And then the other day at work it hit me- GOLD!! 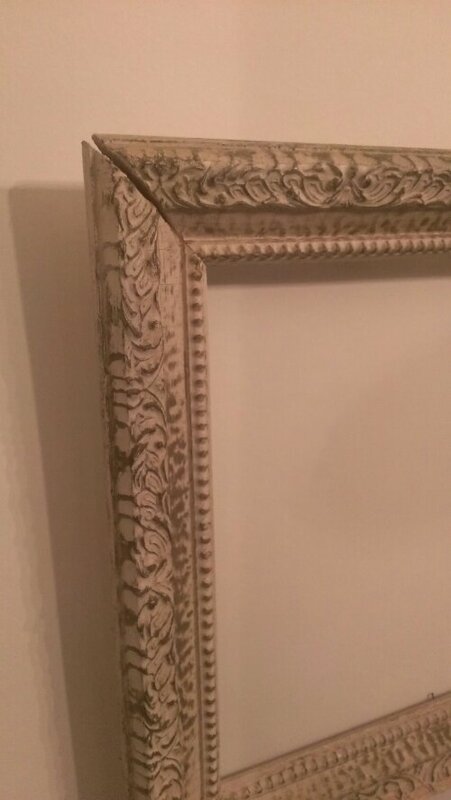 I’ve kind of had the Midas touch lately and have been painting lots of things gold- little things like frames, nothing this big! I knew it would be bold, but we went for it and I love it! 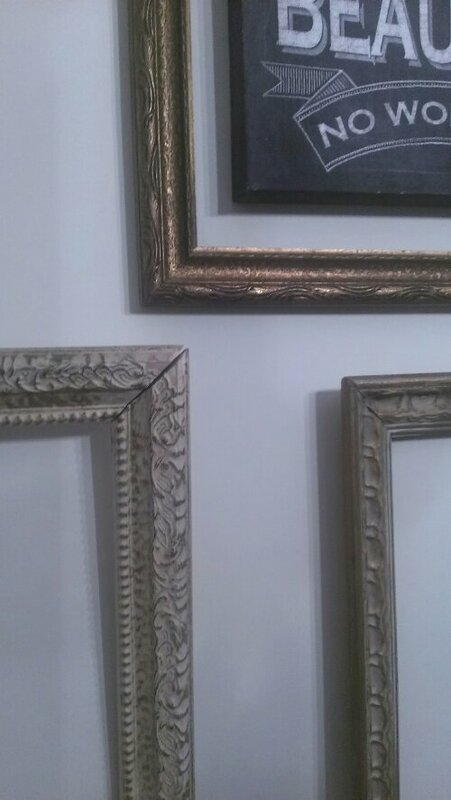 I got the inspiration from the gold detail in those frames I got off the curb on trash day. I guess I never realized before how great gold and silver can be as nuetrals. 2.) 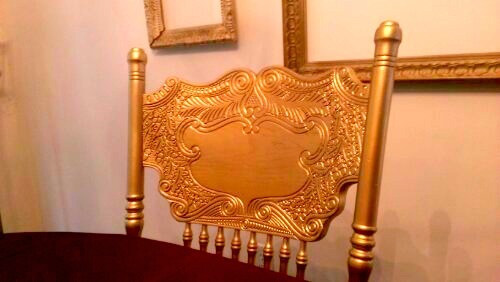 Spray painted the chairs gold with this stuff. Again, used a spray for speed on those details, but slow and steady wins the race. 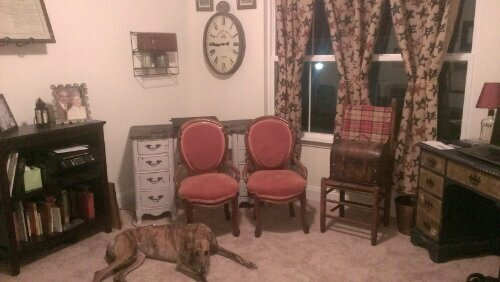 I will probably eventually redo these chairs because the finish is so poor in some places. 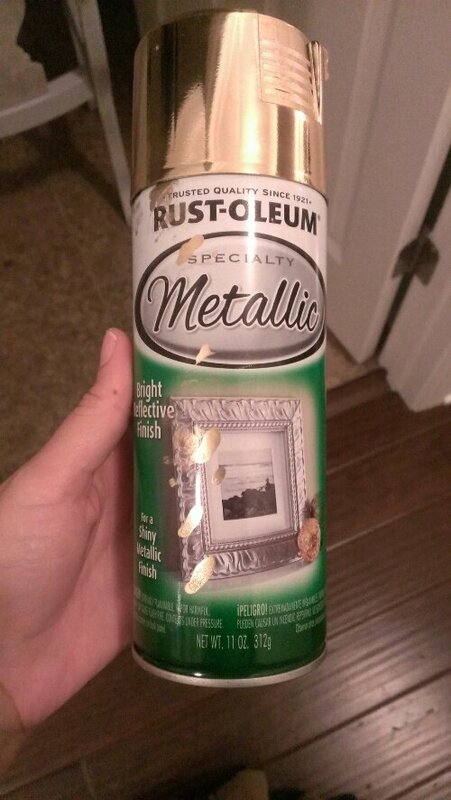 I hear Martha Stewart makes a good metallic brush on paint. Any suggestions? If you do go the spray route buy more than you think you will need, traditional paint goes much further. 3.) 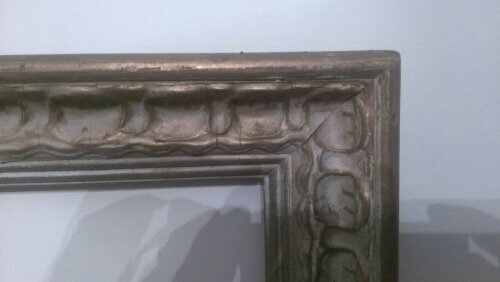 Got in all the carved areas with a sponge and a mix of black stain and Penetrol. 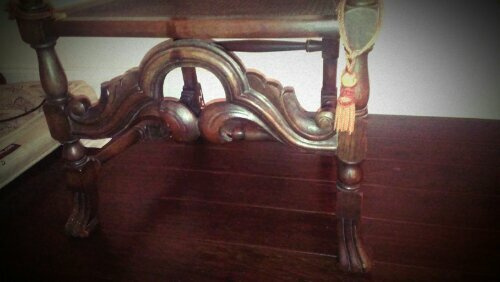 It gives it an antique look and brings out the details. 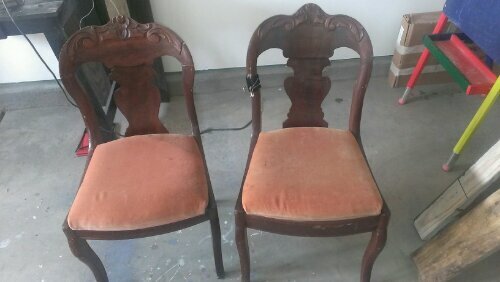 Two chairs side by side- left has glaze, right doesn’t. Subtle difference, but all you have to do is wipe it on, let it sit for maybe 30 seconds and wipe off- so it’s worth the time, in my opinion. Then they reunited with the table. 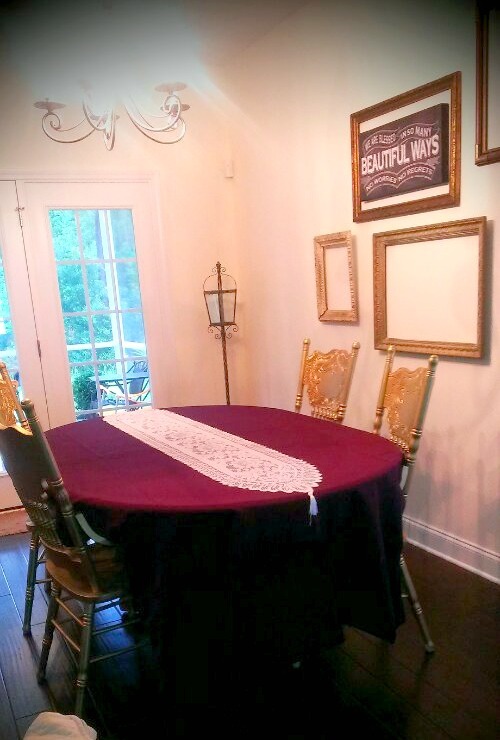 The table is just staying table clothed for now! 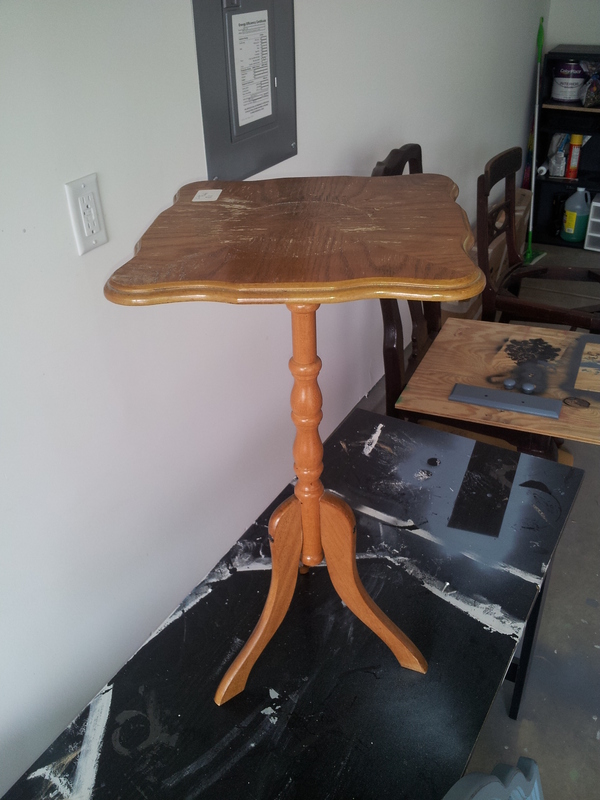 If you saw my Auction Action post last week you might recognize this little stool I picked up for $5. I primed the whole thing and painted the legs Behr Prelude (leaving the metal feet unpainted) and painted the seat Behr Light French Gray. Still a little boring. So I used a French typography graphic from The Graphics Fairy to trace a design on the top. 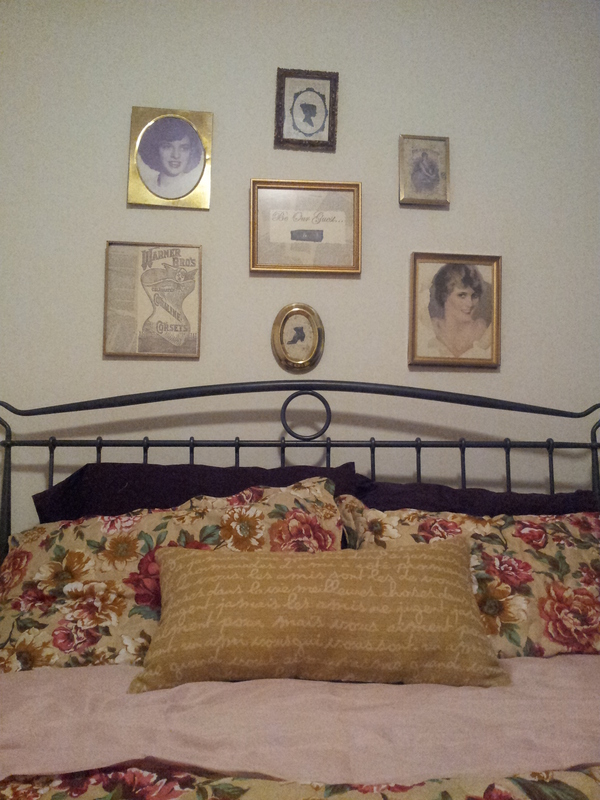 But, I cut it apart to arrange it and space it the way I wanted it. 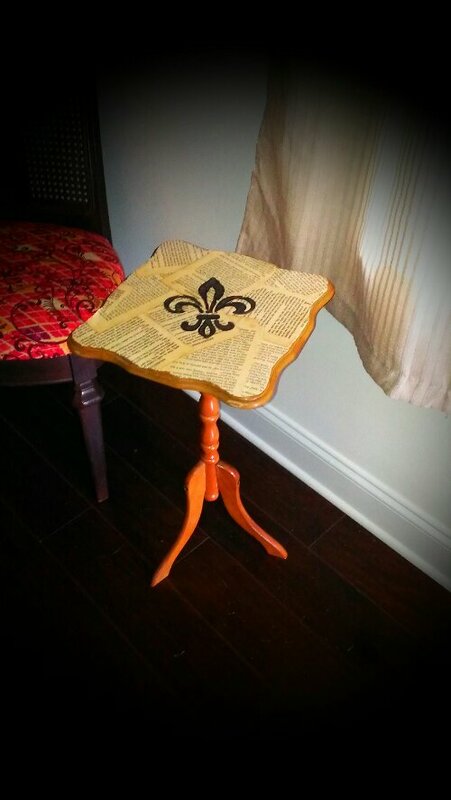 The words were in the graphic- I added the fleur de lis and key using stamps and gold paint. A little distressing and a coat of Modge Podge to protect the top and she was done. No more boring and super easy! I’ll remember to take pictures of the process next time and show you how I trace the design from the computer print. 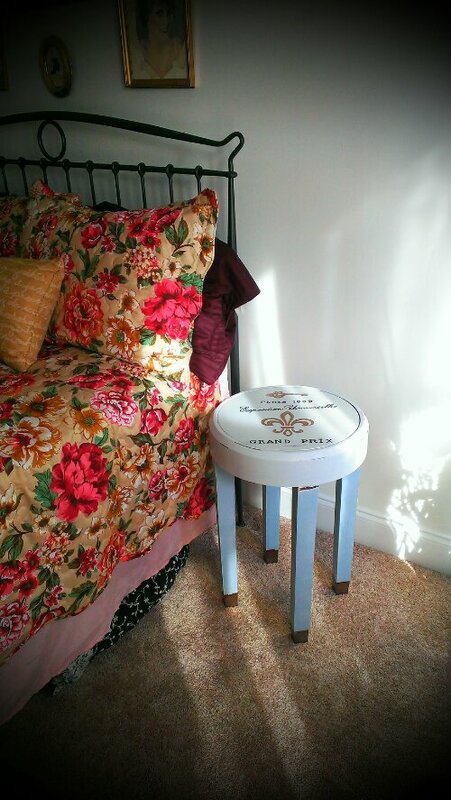 It’s up for sale on Craigslist, but until then it’s in the guest room. Wow! It’s been a little while since my last post, which is kind of surprising since I’ve been crazy busy doing projects! 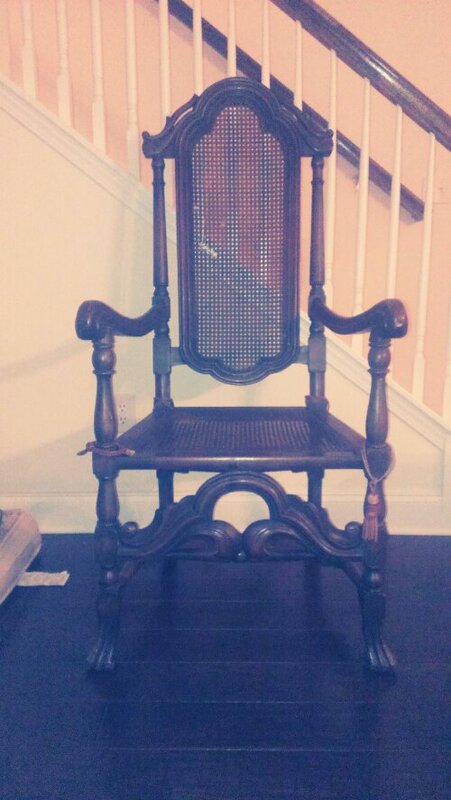 This chair has some cane damage, but it was too cool and unique to pass up! I think I am going to leave the finish as is and just patch over the broken caning with a logo from one of the old coffee sacks I won on eBay. Pictures soon! 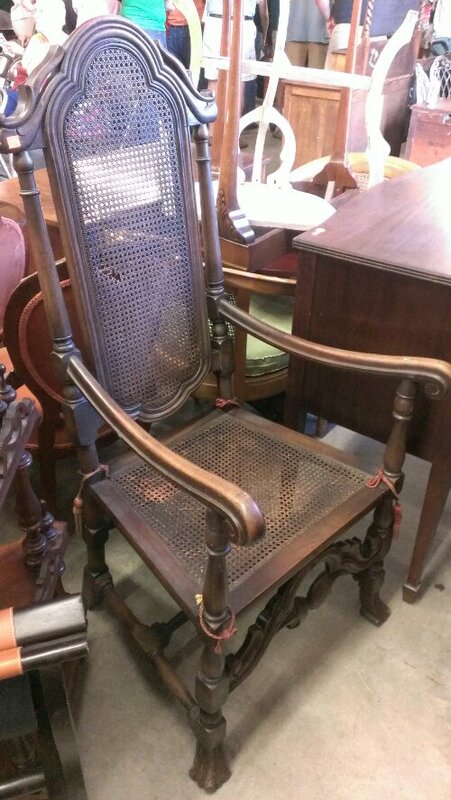 These two antique chairs came in a set and were in perfect condition! They are comfy and beautiful! And $20 for the pair… Yes please! We are using them as desk chairs. Here they are in our office. Cleopatra loves them too. Can you tell? 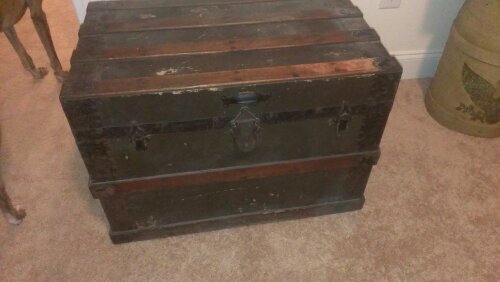 This old trunk is soon going to be the new home for our filing system! 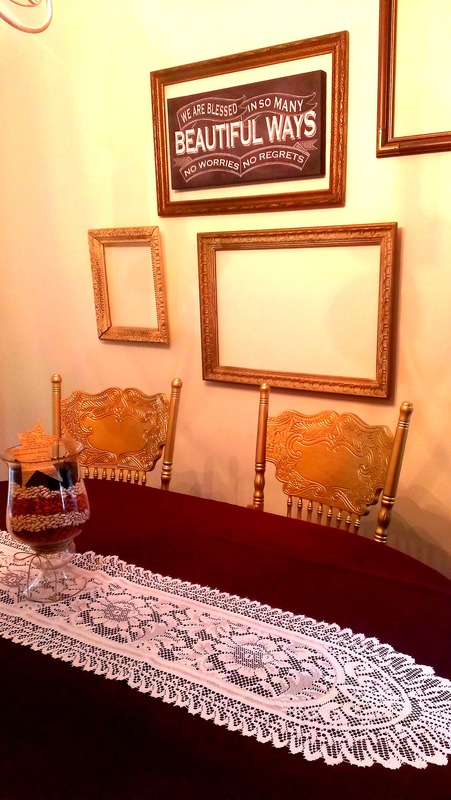 It had a WWI uniform in it that was auctioned off separately. 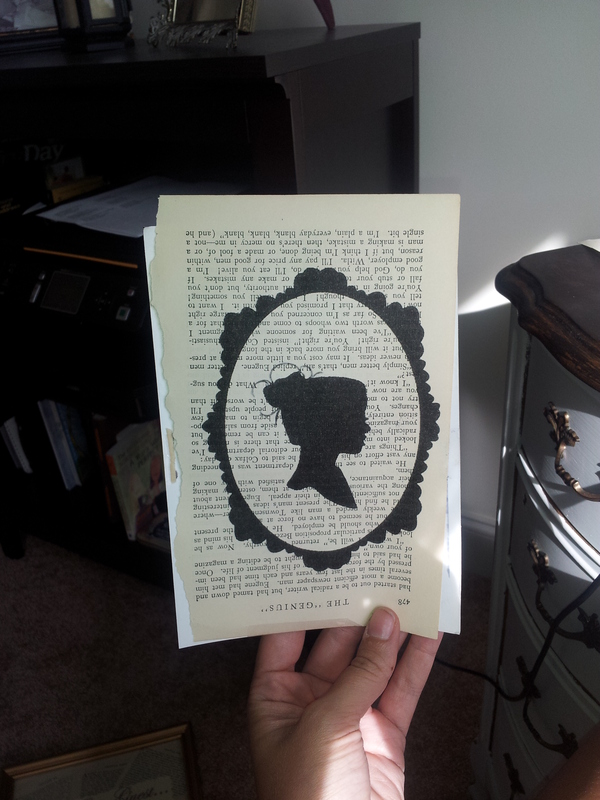 It’s estimated to be from the late 1800s- early 1900s! Goodbye old clutter box, hello fabulous organization! I’ll let you know how that little project goes. These little lovelies needed some TLC but no one else wanted them and I got the pair for $5. Their charm is worth that to me. 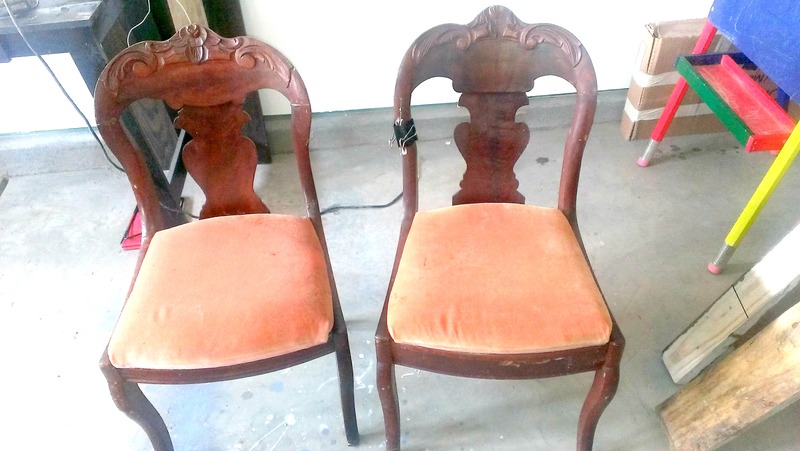 They are in the process of being repaired, painted and reupholstered. 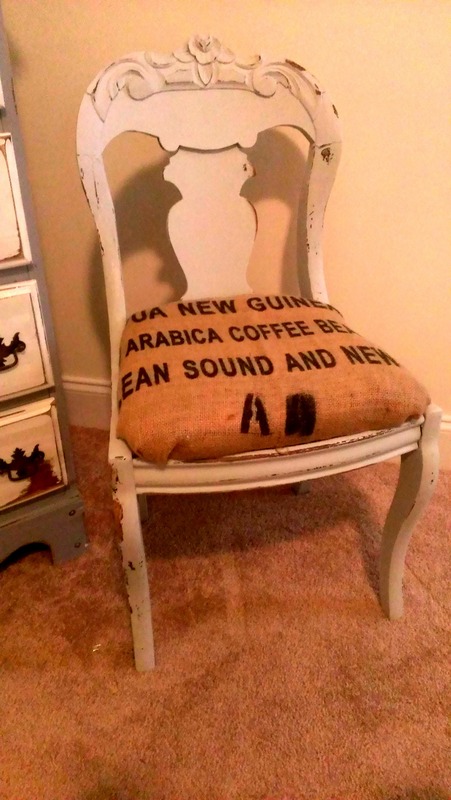 I started painting them white with purple upholstery, but now that I am getting these coffee sacks I am thinking black paint with the logo from the sack covering the seat. 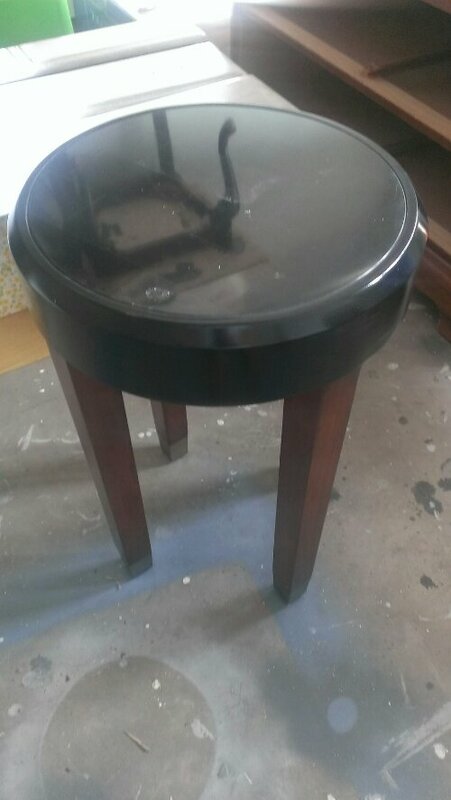 This little stool is plain, but sturdy and cheap. With a quick paint to make it more interesting, I think I could sell it. 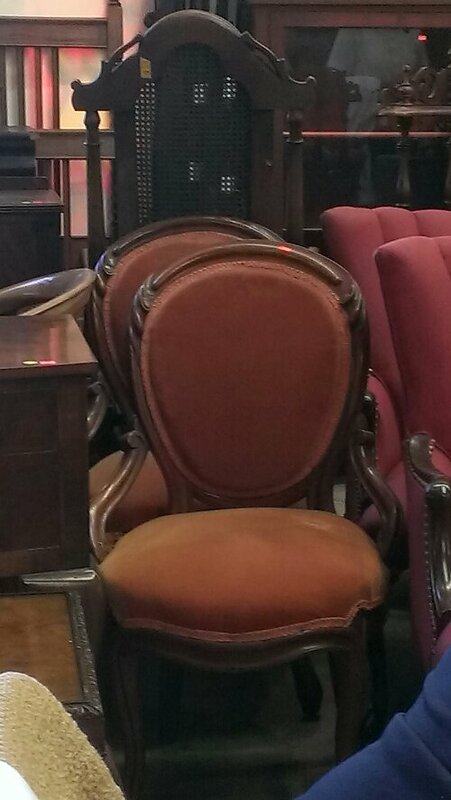 Ever been to an auction? Do you love them like I do? Let me know! Just a quick little post to show off some of last week’s trashy treasures. 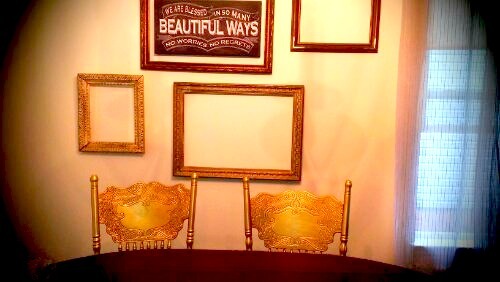 Can you believe all of these beautiful frames were outside on the curb just minutes away from being doomed to the dump?! I couldn’t let that happen! It’s not finished and not a perfect display, but it’s a start. 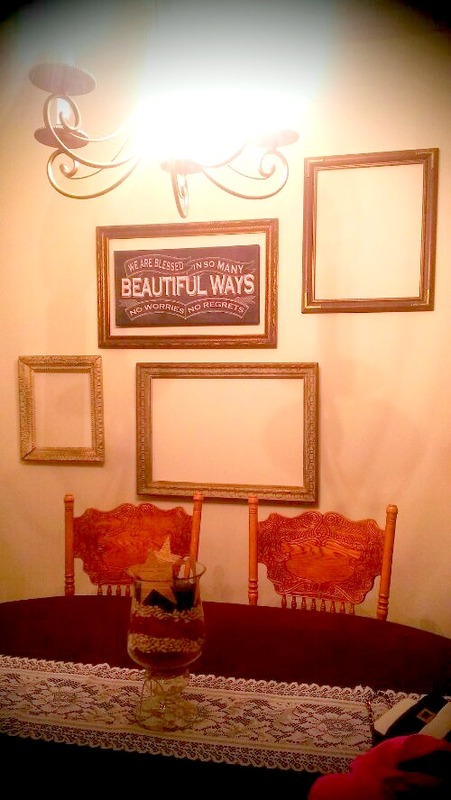 We have been going back and forth about what to do on that wall- when those frames came along we knew they would be perfect! (And what’s more perfect than free?!) Oh, please pardon my bathing suit and purse in the picture… Oops!! Hope yall are having a great weekend!! First, like my new background? 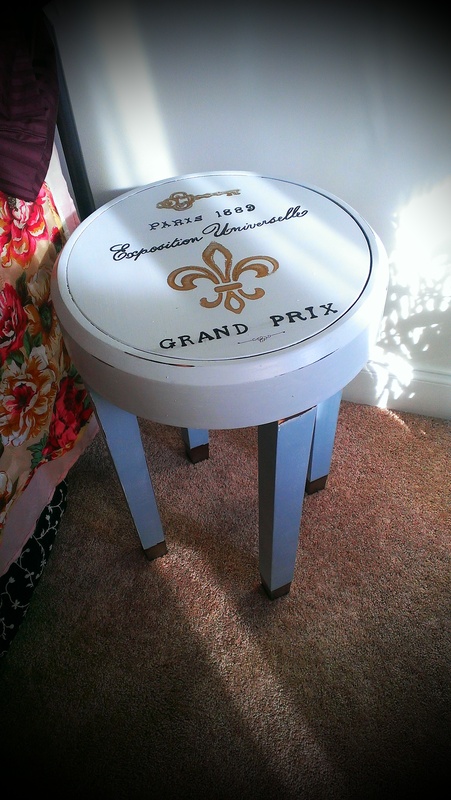 It’s from Knick of Time Interiors. Check out her fabulous blog and vintage graphics!! Friends and family who have been to my house or attended our wedding might know that I love old books! 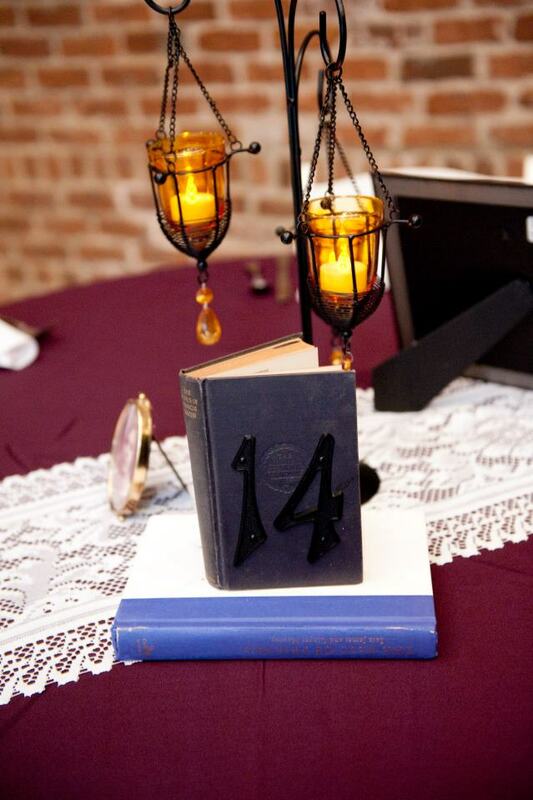 We used old books as the table numbers/centerpieces for our wedding and they line many shelves in our home. I love their old covers, the faded old spines and especially love finding books with really old publish dates and personal notes on the inside cover. I love the yellowing and aging of the pages as well, which is what inspired me to start using the pages themselves in my home decor. *apply a stamp, stencil, sticker, drawing etc. and then frame. *tape your page to a piece of paper so you can print right on it from your computer. *cut out shapes and make a garland or apply it to a different background. 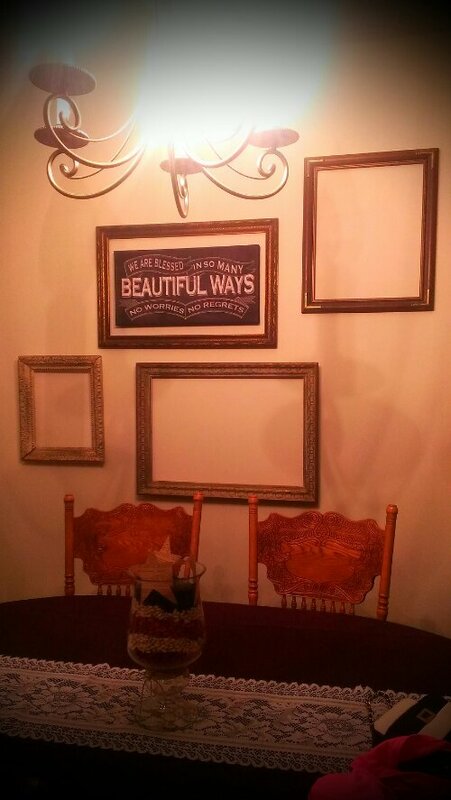 Old books and book pages are instant vintage and add instant romance, in my opinion. 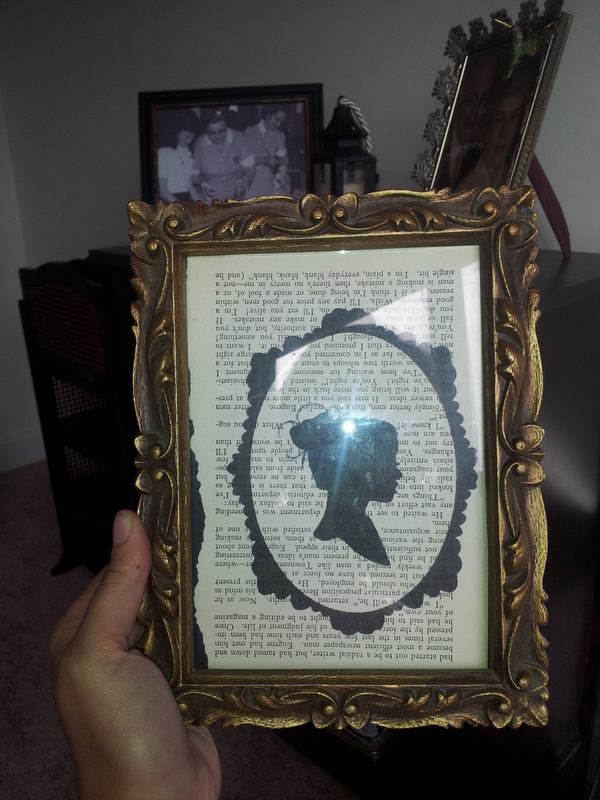 Please share your ideas on using old book pages in home decor! PS: Don’t say read them… I beat you to the punch line.